At some point each season, I have come to expect receiving at least one phone call or e-mail message from a concerned Ohioan reporting they’ve found Giant Asian Hornets (Vespa mandarinia) in our state. Although there have been no confirmed sightings of these hornets in North America, I never reject such reports out-of-hand. In fact, I always thank the person for taking the time to get in touch with me, then I go to work on identifying the insect. I learned this important approach from the USDA APHIS and ODA professionals tasked with eradicating Asian Longhorned Beetle (ALB) in Ohio. They always stress that they'd rather receive and investigate multiple reports of beetles that are not ALB rather than miss receiving a report of an actual ALB infestation. Unfortunately, there are numerous spurious web reports of giant Asian hornets swarming through multiple U.S. states. I do not believe these are intentional "fake news" reports; I believe most are cases of well-intentioned misidentifications or misunderstandings. For example, you can find several reports of the Asian stingers being found in Jersey. That's not the state of New Jersey in the U.S.; it's one of the Channel Islands, officially the Bailiwick of Jersey, in the English Channel. However, it's easy to miss this nuance while scanning web headlines. Reports of giant Asian hornets have generally been based on misidentified European Hornets (V. crabro) or our native Cicada Killer Wasps (Sphecius speciosus). Cicada killer activity is winding down for the season while the activity of European hornets remains in full swing. If you're seeing or hearing that large hymenoptera are stripping bark; they are European hornets. This odd behavior is unique to this non-native species. European hornets were first found in the U.S. in New York State around 1840. Since that time, the hornets have spread to most states east of the Mississippi and a few states to the west. European hornets are impressively large, measuring 1 - 1 1/4" in length. Their black and yellow markings on their abdomen make them look like yellowjackets on steroids; however, their head and thorax have distinct chestnut-colored markings. Yellowjackets have black and yellow markings on the head and thorax. Technically, this non-native is the only "true hornet" found in Ohio. Taxonomically, our native bald-faced hornets (Dolichovespula maculata) are not hornets; they are grouped with yellowjackets which is why they are in the same genus as native Aerial Yellowjackets (D. arenaria). 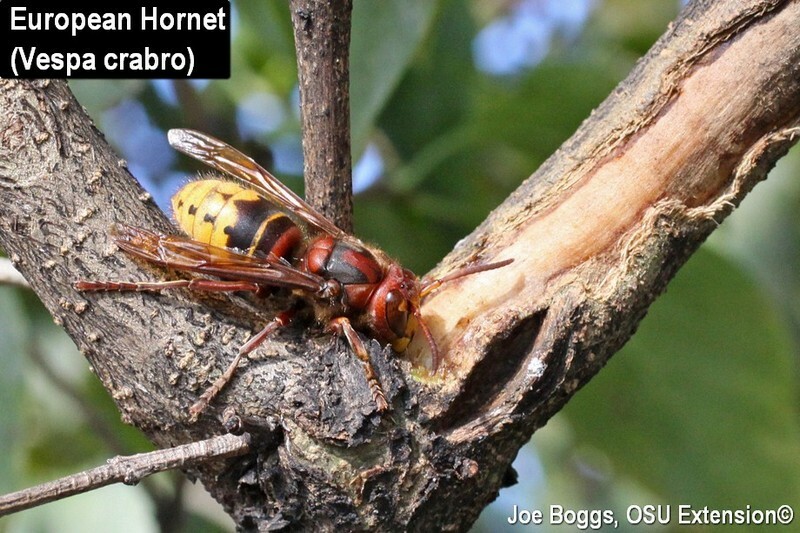 Unlike our native yellowjackets and wasps, European hornets can cause noticeable girdling damage to twigs and branches of trees and shrubs by stripping bark to the white wood. It is speculated that European hornet's bark stripping activity is associated with extracting sugar from the phloem tissue. The hornets may be found feeding on a wide range of trees and shrubs including dogwood, lilac, and viburnums as well as ash, birch, boxwood, horse chestnut, and rhododendron. Although the damage may be noticeable, it's seldom significant enough to cause concern. European hornets construct paper nests similar to bald-faced hornets; however, they prefer to nest in hollow trees and sometimes in the walls of homes. Normally, the hornets behave like bald-faced hornets, wasps, and yellowjackets with only the queens that are produced this season surviving the winter. Under these circumstances, the new queens will soon leave the nests to seek protected overwintering sites; old nests are not re-used. However, occasionally the entire European hornet nest will survive the winter if they are sufficiently protected. Indeed, although it is rare, nests in Ohio have been observed surviving through three winters. European hornets are reputed to be highly aggressive and their large size does make them look pretty scary. However, during past encounters with this hornet, I was able take close-up images and move branches with hornets on them without being stung or even charged by the hornets. Still, landscapers should be cautious around these large stinging insects. Like wasps and yellowjackets, they are capable of stinging repeatedly. The hornets may also fly at night and are attracted to porch lights or lights shining through windows. They have been known to repeatedly charge windows at night inducing panic in homeowners.